The ideal environment for the study of our products. The growth chamber is at the heart of our activity. It is an indispensable instrument for rapid agronomic screening. The chamber can be controlled so as to recreate varied conditions, in terms of temperature, relative humidity and photoperiods. This provides advantages in the study and selection of new products in terms of knowledge, quality and development. Green Has Italia’s growth chamber encapsulates the most contemporary illumination technology thanks to its variable LED spectrum. This system allows for selective spectrum emission, concentrated in tight wave lengths and calibrated to the photosynthetic needs of each plant. 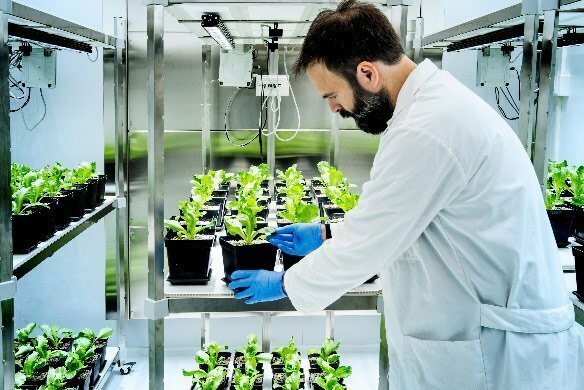 Ilumination technology allows us to recreate conditions of dawn and dusk, submitting the plants to conditions of irradiation very close to those found in natural circumstances. The system is also fitted with 30 fixed cameras. Hourly photography provides continual observation of all phases of vegetal growth.